Over the past 2 weeks I've been watching CNN's coverage of the situation in the Middle East. I'm watching AC360 which is filmed live, so for a 10pm EST show they're filming from the region at 5 in the morning. They shoot the anchor standing outside and I keep noticing the incredible sunrises going on in the background. They're quite distracting. Here we are talking about war and the threat of war and Hezbollah and Katyusha rockets and there behind the anchor's head is this blatant display of increadible beauty. At 5 in the morning the sky is still a deep indigo. As the broadcast continues it moves from blue to pink to a yellow that looks so . . . hopeful. From Larneca to Tyre to Haifa to Beirut it's a lovely view, or at least it used to be. For a moment it looks like just another day and then you hear the sirens. On one hand it's so humanizing, the sun also rises. But at the same time it's jarring. It's so incongruent -- all this suffering framed in the colours of the morning. In in a philosophical way I suppose it's good to know that there is still beauty in a world gone mad, but I imagine the sunrise is cold comfort to those spending the night in basements and shelters and hospitals. I wish these beautiful dawns were breaking over more peaceful days. "Four million newborns [in developing nations] die each year within the first month of life -- half within the first 24 hours of life." What people are doing about it is very simple. STC is asking people to knit or crochet a little hat and send it to Washington where it will be included in aid kits sent overseas. All they ask is that you use one of 4 patterns provided (in part so that the hats will fit) and that the hats arrive in Washington, DC by January 2007. You can download the action kit from the Warm Up America site (partners with STC in this project). The kit has the patterns (very easy), the tag you need to put on the hat and the address to send it to. As I was reading about all this I couldn't help but think about my niece, Corrina. She's 6 months old, happy and healthy and a delight. Janie was able to get all the medical help she needed while pregnant and if anything were to happen to Corrina now there are whole teams of medical people who would rush to her aid. We are fortunate indeed. So I decided to make some hats. I'm aiming for 6, one for each month that Corrina has been here so far. So far I've completed the 4 pictured above. Technically I've done 5, but the first one is gymped (read the pattern wrong.) I've got yarn left over from other projects so all it's going to cost me is a few stamps and some time. Years ago I remember someone talking about the idea of tithing our time, how in some seasons of life it becomes fairly easy to give money and tithing time instead is a more noticeable sacrifice. I'm not sure I'm in a place where I'd say giving money is easy, but I like the simplicity of giving time working such a simple pattern that could have such a profound impact. I remember the first time I got to meet Corrina. She was 6 weeks old and I kept marveling that her head fit in the palm of my hand. 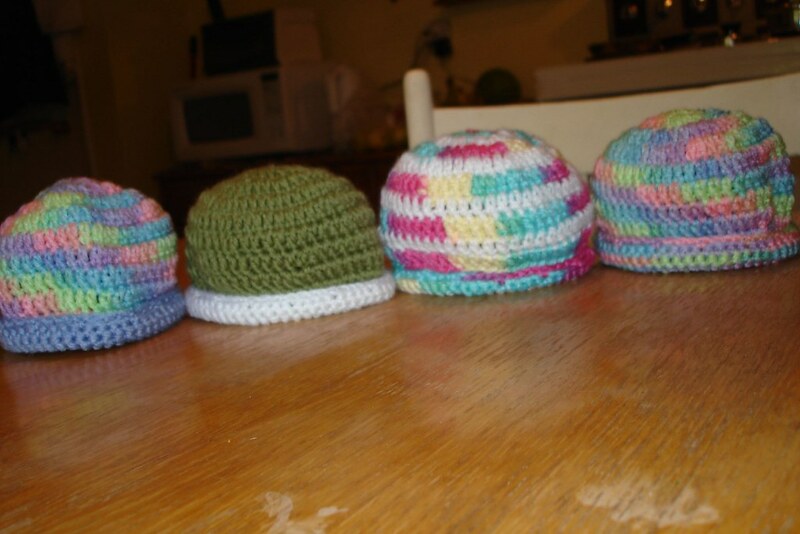 Now looking at these little hats it's easy to be reminded how defenseless little heads can be. It's almost absurd to think a little hat can help save a life, but then it's equally absurd that it takes so little to end one. It's a tiny thing to do, I know. But the smallest gesture is an infinitely larger contribution than doing nothing. I can't save the world, but I can save it a little tiny bit. Mom and Dad have been here visiting this week and we've had a great time. As I was deciding what I wanted to show them this trip we ended-up spending a lot of time on ferries. And thoroughly enjoying ourselves. On Tuesday we took the Grandville Island ferry back and forth across False Creek. We grabbed a great lunch at Grandville Island market and then rode the waves all the way up the creek to Science World. (And in the process discovered where they stash the Symphony of Fire, I mean 'Celebration of Light' barge between seasons.) We headed over to English Bay to see the Inukshuk and ended-up back at the maritime museum. A great day on the water for just $12. Nice. Thursday we went from the itty-bitty Grandville Island ferry to the Granddaddy of them all -- the Tsawwassen to Swartz Bay ferry. Even bigger than the ferry to Manatoulin Island that I remember from when I was little. (Although they call that ferry the Big Canoe which is much more fun.) The big ferry took us over to Victoria where we learned a new word -- muckle -- had an amazing high tea at the White Heather (highly recommended), toured Craigdorrach Castle and went for a walk along the water. 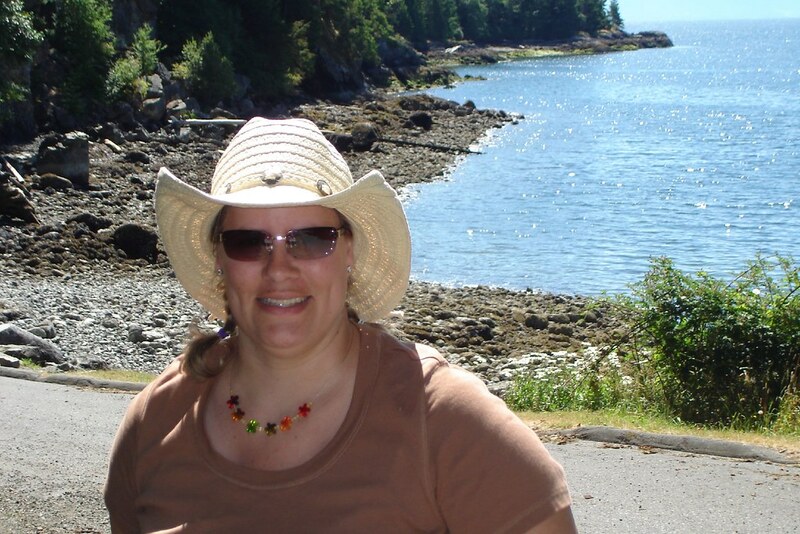 Today, Saturday, we headed in the opposite direction and took a mid-size ferry to Bowen Island. You have to love a place that calls its main harbour Snug Cove. (Altogether now. . . . . .awwwwww) We had perfect, amazing, beautiful weather. Bowen Island is classic west coast picture postcard -- blue water, big sky, blue mountains and lots and lots of green. I can usually go a long time between dreams of owning a boat but today. . . .today it would have been really nice to be able to get out on that water. Ferries are a great start, but it's not quite the same. I really feel like I've stepped out of my regular life this week and had a vacation. I didn't do things that probably needed to get done, I didn't think about work. I even managed not to check my email even though decisions are being made that had I been in the office this week I would have been part of. For me the mental rest is as important and as physically being away and I think I really achieved that this week. How incredible to be able to spend these days with people that I love laughing and talking and looking at incredible beautiful sea and sky. A true vacation indeed. And I have the photos to prove it. My parents are out visiting this week so it's vacations all 'round (Whoo hoo!). Yesterday I took them to Shinjuku, my favourite Japanse restaurant, for their very first taste of sushi. I have to say they did very well. 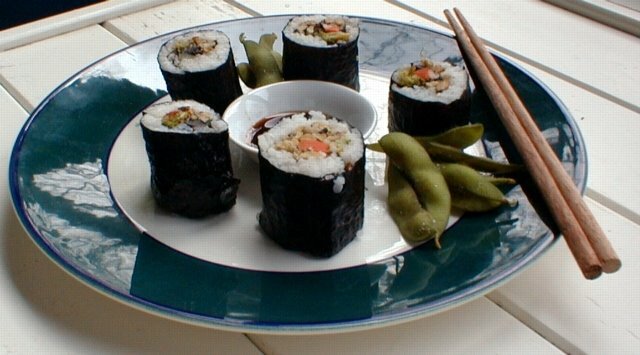 We kept it vegetarian (because I can't do raw fish) and had a great time. They tried edemame (my new favourite snack), vegetable tempura, gyoza and a couple of maki. I made sure there was nice, safe chicken teryaki just in case some of the other tastes didn't sit so well but they were champs. They even masterted the art of picking up a single grain of rice with chopsticks. Nice. We were already down at the beach so we had to stop by Dolce Gelato to see what Davide had in store. The man is an artist and his gelato. . . divine. Good job there's a lot of boardwalk down there for walking it off. I came across a new phrase the other day -- memento mori. It translates from Latin as "remember you are mortal". The phrase came up in an article I was reading last week and then again in my current book -- Brad Thor's Blowback. I haven't read Thor's work before but I needed something a little more suitable to a long week-end and so far he has not disappointed. I'm intrigued by the concept of memento mori. Apparently it shows up in art quite a bit. Thor writes that in ancient Rome when a returning General took his victory parade through the city a slave would walk by his side whispering "remember you are mortal, remember your death". Macabre on the surface perhaps, but I think that we would do well, I would do well, to remember that we're not here forever. Last week I was thinking about how as humans our 'finiteness' defines us. We are fundamentally limited -- not in potential, but in time. I was reminded of a friend of mine who was on Phi Phi Island when the tsunami hit. He spent hours and hours helping to get people to safety and reached a point where he couldn't lift his arms. He had nothing left to give. Walking back to where he was staying people called out to him and he had to walk by them and it tortured him. But he was empty, he had already given everything he had and more. He had reached the edges of his strength, the horizon of his endurance. And yet the guilt was there even though he had nothing in the world to feel guilty about. Finite cannot apologize for failing to reach infinity. To see a world in a grain of sand, And Heaven in a wild flower, To hold infinity in the palm of your hand, And eternity in an hour. Maybe that's simply the reality of being finite, that yearning to reach out towards the infinite. Perhaps it's what draws us to beauty and ultimately to faith. I think so often we try to outrun our mortality, our limitedness, in trying to look younger, move faster, cram more into the day. I don't think denying finiteness is the way to go. Memento mori could prove a much more effective way to redeem the hours. 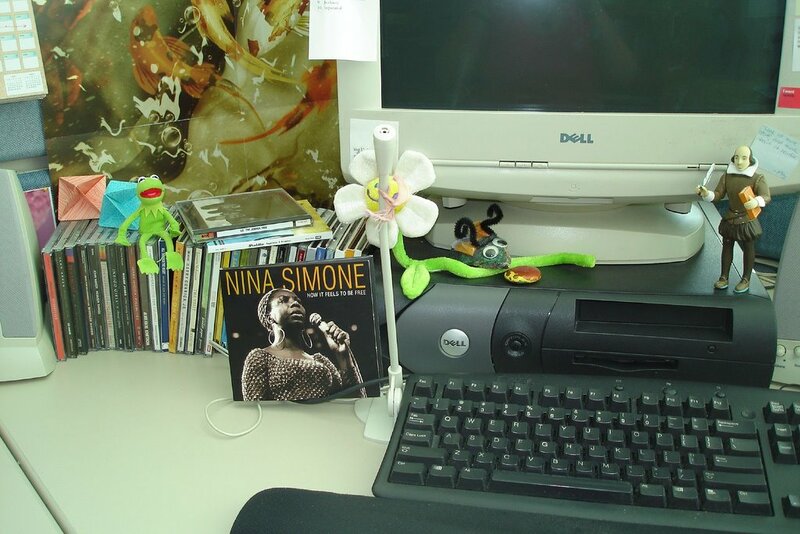 This is my desk at work and today the Nina Simone CD so prominently featured saved the day. This was one of those days when there was only one time-critical thing that needed to be done and I was finally able to finish it 20 minutes before the end of the day. Everybody needed me today. And hey, it's great to be needed, but sometimes you need a little back-up and the William Shakespeare action figure just isn't going to cut it. "Darling, you are always needed. . . "
"I wish I knew how it would feel to be free. . ."
"I need a little sugar in my bowl. . ."
I was first introduced to the wonder that is Nina Simone my third year of university. My roommate Roni had Nina Simone Sings the Blues and it became our go-to album for late nights and term papers. When our brains were too tired to think and our fingers too stiff to move we'd skip over to track #8 and let the world melt away. Worked every time. Turns out it still does.